Officially launched to an international audience at the American International Motorcycle Expo in Florida, Skycraft is the world’s first purpose built freestyle motocross machine and a collaboration between action sports innovators Unit and world-renowned motorsport entity Triple Eight Race Engineering Australia. 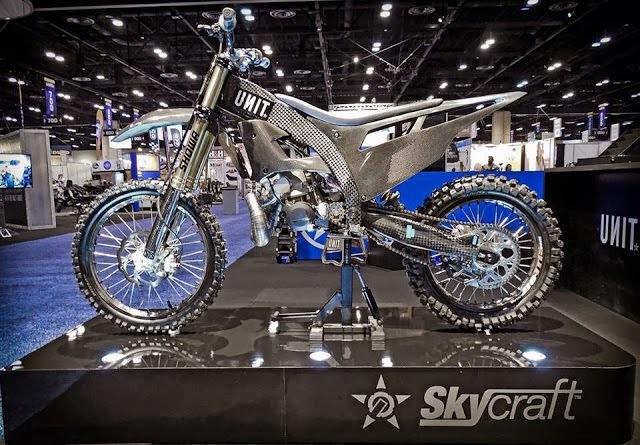 Conceptualised by Unit co-founder Ian Everest, the Skycraft prototype was engineered by an expert team at Triple Eight, led by acclaimed Technical Director Ludo Lacroix. Ian Everest stated: “The original design brief recognized the opportunity for an ‘out of the box’ product for freestyle motocross. All other forms of motorcycle sports use purpose built machines. “FMX riders have no option but to adapt and heavily modify motocross bikes. It made sense to explore what an FMX specific bike might look like. Being a concept motorcycle it also meant we were not constrained or restricted by production or cost requirements. “We felt that weight reduction represented the best characteristic to provide riders in their quest for bigger tricks as well as helping them innovate new maneuvers,” added Everest. “The prototype we’re launching today is the product of a combined effort and the engineering foresight and expertise of Triple Eight Race Engineering Australia's Ludo Lacroix. “We must extend a special thanks to the Triple Eight team including Roland Dane, Daniel Williams and Robert Clarke along with Unit's Marketing Director Matt Cousins."